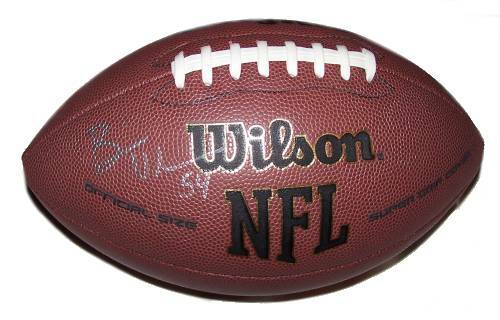 A Wilson NFL football signed by Brian Urlacher of the Chicago Bears. Comes with a Certificate of Authenticity. Brian Urlacher is an American football player for the Chicago Bears of the NFL. Urlacher, an alumnus of the University of New Mexico, is a six-time Pro Bowl player and has established himself as one of the NFL's most productive linebackers. He is regarded as one of the best defensive players in the NFL, winning the NFL Defensive Rookie of the Year Award in 2000 and the NFL Defensive Player of the Year Award in 2005, becoming only the fifth player in NFL history to win both awards ~ Wikipedia.